This week I sat down with the star or Weeds, SNL, and numerous films. We discussed his advice to the world, the relationship between comedians and the banjo, and that he has funny YouTube ideas, but how it just seems like too much work. Andrew: If you could give the world one piece of advice what would it be? Kevin: Bring your cell phone charger wherever you go. Andrew: You are a South Bay native what’s the best and worst part of the South Bay? Kevin: The worst part of the South Bay is parking and trying to get home during rush hour traffic. The best part is it’s a great community away from Los Angeles and the sunsets... while completely tanked. Andrew: Are you sad that you might be to old and frail to throw a football to your child, Gable by the time he’s in middle school. Kevin: Middle school, how about kindergarten? Andrew: When was the last time you played the banjo? Are you still playing the Banjo? Kevin: Yeah, I played it five minutes ago. I keep one in my trailer, here on the set of Weeds. Andrew: You play it in the tailer? Kevin: Yeah, I practice here. It’s the only place I can play it without people complaining. Andrew: I know you played Live at the Lounge once when John McEwen came down with members of the Nitty Gritty Dirt Band. The two of you get together with Steve Martin play together once in awhile. Have you done that recently? Kevin: Yeah, that was fun. I love playing the banjo. I was visiting New York about a month ago and we got together with not only him but also with some of the best banjo players in the world, Tony Trishka, Mark Jonhson, Mike Munford and Billy Connelly. Andrew: The Billy Connelly the actor/comedian? So there’s a relationship between the banjo and comedian’s. Kevin: I think so, yeah, more so than a tuba. I think tuba’s are more for poets. 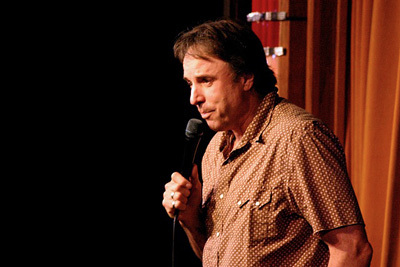 Andrew: TV star, movie star, best-selling author, voice of our cartoon - what’s next for Kevin Nealon? Kevin: Well, if all that works out then tycoon. Andrew: If you could change one thing about yourself what would it be? Kevin: I think it would be my posture, but no I could change that, but I choose not to. It would be...I would make my son older than me. Kevin: So that he wouldn’t want to throw the football around. Andrew: Does it ever happen to you where a sketch idea will pop into your head and then you will give Lorne Michaels a call over at Saturday Night Live? Kevin: I’ve thought about that before, but now I think, no I’ll just do it myself and put it on YouTube. Have I ever done that, no. I’m too lazy. It just seems like a lot of work. Andrew: You have over a million followers on Twitter. What is it like knowing that you have a thought in your mind and then you tweet it out and a million people read it? Kevin: Well, those are just a million followers, not necessarily over a million readers. It’s nice having that type of access to people. I mean I couldn’t get a better deal from Sarah Ferguson, the duchess of York, then that. Andrew: Right now you are working on season six of Showtime’s Weeds. Can you give us a little teaser of what’s coming up on this season? Kevin: Season six premiers August 16, 2010 and all I can tell you is that we are going to need a Rand McNally road atlas. Andrew: Finally, what is your favorite thing to eat when you come down to The Comedy & Magic Club? Kevin: I love the penne pasta with broccoli. That is another thing I like about living here because it’s so close to The Comedy & Magic Club. The best food in the South Bay. 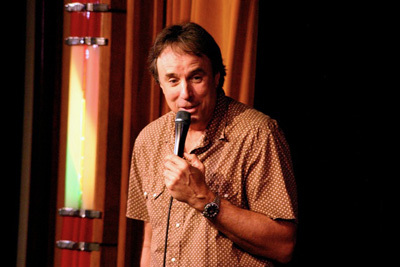 Kevin Nealon will be headlining The Comedy & Magic Club Friday, June 11th and Saturday, June 12th 2010. Reservations required. (310) 372-1193 or comedyandmagicclub.com.